Critically Endangered Eastern Bongo Antelope Born! Congratulations to mother Djembe and father Ekundu at the Taronga Zoo! Djembe recently gave birth to her third calf (all with father Ekundu) of this critically endangered subspecies of the Eastern Bongo antelope early this February. Zookeepers have not yet sexed the calf as it has been spending important time bonding with his/her mother. Her experience as mother was evident immediately as she bathed the new born following his/her delivery. The calf has now rejoined the exhibit and, according to keepers, has shown healthy curiosity, exploring their home but all the while following mom’s lead. The Eastern Bongo is listed as Critically Endangered whereas the Western Bongo subspecies in considered near threatened. Current estimates place wild Eastern Bongo numbers at only 100 individuals. Without doubt the calf’s arrival is a boon for the subspecies’ survival. In addition to the zoo breeding efforts, the Taronga Zoo also participates in the Bongo Surveillance Project located in Kenya, the Eastern Bongo’s native range. 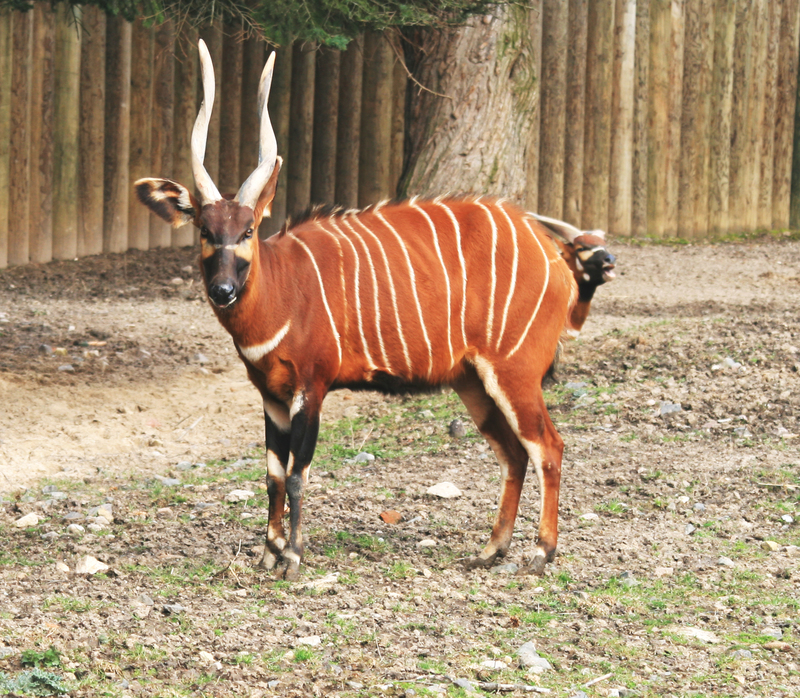 The Bongo (Tragelaphus eurycerus) is the largest antelope species in Africa, measuring 1.5 meters at the shoulder and up to two meters in length. Both species’ coats are striped with 10-15 stripes and sport spiraling horns that can grow over a meter long at maturity. Find out more about the new calve at ZooBorns. Additional info about the species can be found at the ARKive website. Follow The Good News Review on Twitter @tgnreview and Facebook for even more stories!